Yes! Mojito Lamingtons. 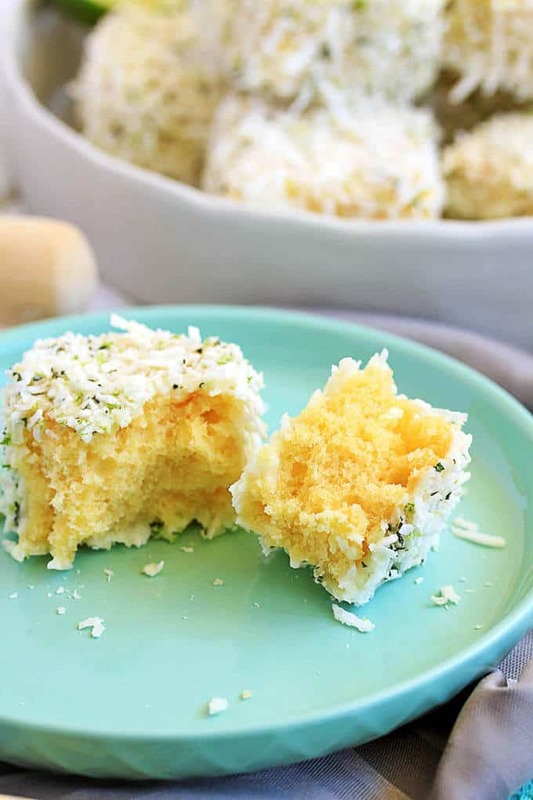 An Aussie favourite and a refreshing Cuban drink unite into some zesty little cakes. Ok, Lamington lovers. Don’t hate me but, yes, I did this and it was oh, so worth it. Before the traditionalists of you turn away in disgust, hear me out. The good old traditional lamington is still my favourite but this is definitely a fun and tasty twist. Dee-lish-us! You have to love a food that has an entire day devoted to celebrating it’s entire existence, right? Us Aussies love our lamingtons and why wouldn’t we? Sponge cake and chocolate. Yum! Coated in coconut. Well that’s just handy because otherwise you’d just get chocolate all over your fingers. And dare I say it, sometimes filled with jam and / or cream. Mm, mm, mmmmmmm. So sometimes my brain just goes off on crazy little jaunts and it did, so here we are. Mojito Lamingtons. First, the base is a light-as-air sponge cake. Rich and buttery and zingy with lime zest and juice and I could scoff these all on their own. Then we have the coating. The cute little cakes are dunked in a milky white chocolate sauce which is also spiked with lime, then, fresh from their swim in white chocolate, they get covered in a coconut coating. This coating is interlaced with that all important mojito flavour of fresh mint and, you guessed it, more lime. So, next week I’ve got plans to bring you some great Christmas recipes from a super simple dessert idea (and I mean suuuper simple – keep an eye out) and some great little appetiser ideas, to things I grew up with on our Christmas table every year and it just wouldn’t be Christmas without. It’s my absolute favourite time of year so I can’t wait. Grease and line a lamington tin and preheat your oven to 160C Fan / 320F. Sift together the flour, cornflour and baking powder and mix well. Beat together the sugar and butter until very light and fluffy. Add the eggs one at a time beating very well between each. Add the vanilla, zest and juice and beat again. Add flour mix and milk and gently fold through with a spatula, until just combined. Spread the batter evenly in prepared tin. Bake for 18-20 minutes until just cooked (a toothpick inserted should come out with just a couple of crumbs). Allow it to cool slightly, then turn out onto a wire rack to cool completely. Trim edges off then cut into 20 squares. In a wide bowl combine the coconut, zest, mint and icing sugar and mix thoroughly. Combine the milk and chocolate in a small saucepan over low heat and stir constantly until the chocolate is almost melted. Pour the lime juice into the icing sugar then add the chocolate milk mixture. Stir until smooth. Using 2 forks, drop cake squares into the glaze and coat well. Allow excess to drip off then roll it in the coconut mixture. Place them in the fridge to set.